This is a guest post by Taylor Allred, Executive Coordinator for South Carolina Interfaith Power and Light (SCIPL). The post was originally published on SCIPL’s website here. Successful mitigation depends on global cooperation. 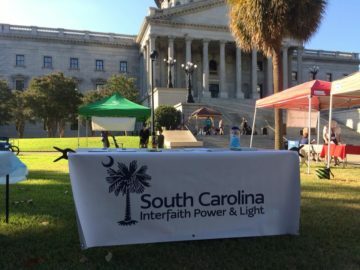 Like the rest of the Deep South, South Carolina is a stronghold of both political support our country’s refusal to act, and a widespread cultural commitment to organized religion and its influence on politics. As a result, we now find ourselves in a pretty unusual situation where the response of our local faith communities to climate change could have an enormous impact on the future of our species and all other living beings.